If you're not making your sales plan, could your employees' engagement levels be to blame? Employees who are engaged actually receive 2.5x more revenue than employees who are not. Plus, 40% of employees who are not properly trained are very likely to quit their jobs, resulting in a high turnover that no one wants to see. These facts point to one solution: The need to increase employee training and engagement. What better way to do this within a pet store than with training, events, and other enriching activities? While no doubt there are many good reasons to invest in better employee training, there are still a high number of store employees who lack the proper training required in order to maximize sales. Why is that? Training pet store employees is often easier than it sounds. They are often associates who may feel overworked and underpaid and are possibly working for your store as a way to make it by in life. Additionally, proper training takes time and resources that many pet retailers just don't have. By the time all is said and done, the effort may not seem worth the reward. However, there are many reasons why proper employee training is actually crucial for pet stores. If one of your primary challenges is standing out from the competition by using highly qualified and engaged employees, then this particular benefit applies to you the most. This alone should be the only reason you need to consider incorporating additional education for your employees. For many independent pet stores, getting a customer to choose you over the closest big box store or e-commerce retailer can be something that keeps you up at night. A great way to differentiate from these competitors is by boasting a very well-trained staff that will help your customers pick out exactly the product that matches their needs. However, your employees won't be able to do this without well-rounded knowledge that they will receive from consistent training and engagement with the management team. Many big box stores and e-commerce retailers may have the benefit of convenience, but they don't necessarily get the in-depth knowledge for each and every one of their staff. This knowledge will help your customers know they are making the right decision when they buy products at your store, and will keep them coming back. As a store owner, you are likely wearing many hats, and there's always too much to do in the day. Of course it would be nice to delegate to your employees, but they likely haven't gained your trust nor are they as passionate as you may be. 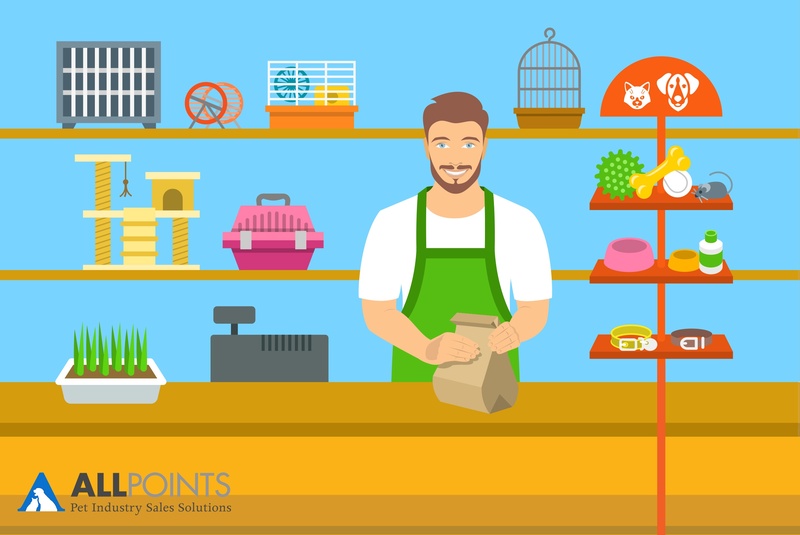 Once this is realized, the question then becomes: How do you take a regular pet store associate and turn them into a real asset for your store? The first step is to build employee confidence within your pet store. In our experience, we have found that many products are better sold through experiences than just by being displayed on a store shelf. By allowing your employee to take the food home and use it with their pets (or as their lunch! ), they will be allowed the opportunity to see, smell, feel, and even taste the quality of the food. The same goes for toys, treats, and any other products that are easy to credit to your manufacturer for training purposes. We have also discovered that retailers who create focus months with specific themes for training were able to successfully increase their employee engagement. For example, a classic focus month would be October to train on pumpkin benefits for dogs and other fun Fall themes. Finally, educating your employees is the best way to increase their confidence when selling products that uniquely meet their individual needs. You can enroll your employees in programs such as Pet Store Pro and request in-store training sessions from your manufacturer reps. The opportunities for education are endless! As pet owners, we can generally agree that a huge pet peeve is walking into a store, asking the associate's opinion on what product works best for our current needs, and having them just shrug half-heartedly before offering the most expensive option at you. Not only is this unhelpful, but it is also a frustrating experience which will likely make us, as customers, less likely to head back to that store. The problem in this situation is generally two-fold: The associate is not passionate about his job, and he is also likely not trained to find a solution that perfectly matches the customer's needs. What happens when a customer comes in with a rabbit who has specific dietary needs? If your employees are unaware of the bigger picture in small animal, and especially rabbit, nutrition and care, then your customer will likely leave frustrated and with an empty basket, resulting in a missed opportunity and future sales. Educating your employees on the bigger picture within product categories will allow them to find a personalized solution for each and every one of your customers. This is not only fantastic customer service, but will also keep your employees confident in their selling techniques and increase the overall mood and atmosphere within your store. When your customers are happy, everyone is happy! The best part about managing a pet store is that you don't necessarily have to do it alone. By reaching out to your manufacturers, you'll be able to take advantage of the resources, knowledge, and market awareness that they may have to offer. The main problem with reaching out to individual manufacturers is that many only offer training for their particular products. While this is great for those who need to learn more about them (especially for brands that are brand new to your store), it doesn't necessarily give your employees the bigger picture, and having one rep from each brand you carry can result in many different people showing up at many different times! One of the benefits of bringing on an All Points Marketing brand (or more than one) is that you'll be receiving training from reps who are experienced in all areas of the pet industry, not just our products. This means that if you coordinate with All Points Marketing to train you on Supreme's Tiny Friends Farm line, we won't just stop there. We will take the time to train your employees about small animal nutrition and care in general, so that your employees are equipped with the right amount of knowledge to make the best decision for your customer, even if that doesn't mean Supreme wins that particular sale. Additionally, because we represent more than one line of products, the more products you carry, the more customized training you will get. Instead of having five reps for five different brands of pet products come in for training, you get one rep for five different products who will train on the benefits, give you the context in terms of product category, and allow your employees to see the bigger picture in the overall shopping journey for your customer. So go ahead, request your free training session from us. Additionally, feel free to reach out to your other manufacturers and see whether they'd be willing to come in and train your employees. With all these benefits, the rewards of properly trained employees will definitely be worth the effort.